I’ve said it before and I’ll say it again: I’m not a motorcycle guy. Where wind rushing through what’s left of my hair is concerned, my Hyundai Elantra’s sunroof is more than enough. 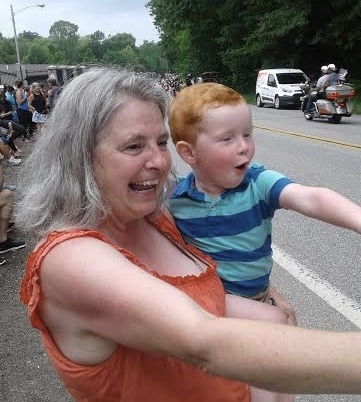 What I can’t get enough of, though, is witnessing bliss, so for the second year in a row, wife Kathy, grandson Cole and I stood on Glenwood Park Avenue to wave at the motorcyclists in parade as part of Erie’s Roar on the Shore celebration. My sister Cathy and her wife Betsy Ann joined us on the berm for half an hour of rumbling, infectious joy. Last year Cole watched in stunned silence, but yesterday he about lost his little ginger head. “Oh my goodness,” he said, wiggling in Kathy arms and adding his rosy-cheeked glory to the evening’s pageantry. Hearing that three year old chirp over and over “Grandma Kathy, look!” and “Pop, hey Pop, did you see that?” was reason enough to take in the parade. But to tell the truth, hanging out beside a road in soul smothering humidity as thousands of riders slowly process by, revving the ever-loving crap out of their engines is not this pop’s scene. Picture artist-fartist. Think staring at a Jackson Pollock and wondering what he was getting at or savoring the hush of appreciation after Mary Oliver reads a poem. 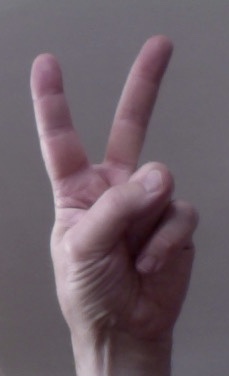 If anything is going to make a lot of noise, let it be crowd-pleasing end of Rachmaninoff’s 2nd Piano Concerto. And then there’s adventure. My idea of risk-taking is sailing on the Victory Chimes, which slips along calmly off the coast of New England, protected from serious waves by the islands, and serves smoked salmon, cream cheese and capers on deck at 4:00 p.m. In two weeks, when Kathy and I board this schooner that graces the back of the Maine quarter, the only splash I expect is that of a decent Chardonnay making a whitecap in my long-stemmed glass. Part of me would love to love downhill skiing or bungee jumping or straddling a Harley, but the one thing worse than being sedate by nature is pretending to be wild and crazy. 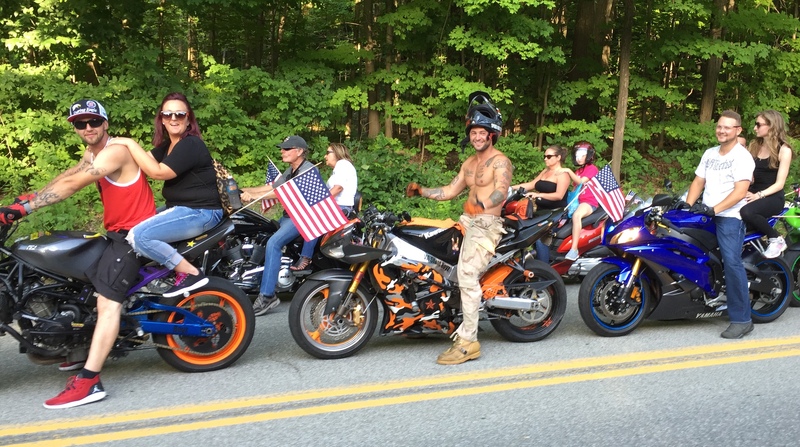 Besides, the spectacle of bikers can’t be a hit without non-bikers lining the route. We need each other. We really do—at least I do. This fact wasn’t clear to me until the roaring began in earnest and giddy faces passed by and suckers and Tootsie Rolls landed at the children’s feet. Oh, those faces. Some of them got my message. I could tell. When I laid one of my big sloppy smiles on them, they often sent one back, and it was as if we two strangers recognized each other. The whole deal got me choked up, probably because right then and there the word stranger exited the English language. The traffic never stopped this year for a good photograph, so these smiling faces are from last year. I still remember them all, like old friends. Taking its place, I now understand, was a sweet word: hope. Am I waxing poetic? Don’t you believe it. We human inhabitants of planet Earth are increasingly cranky, thinking and acting from our reptile brains, and our venom is crazy lethal. Where is our hope? I saw it at the Roar on the Shore’s motorcycle parade. I saw it most of all on one man’s face. He was nothing remarkable, just a gray-haired dude with a wide smile rolling north on Glenwood Park Avenue. And thanks to Roar on the Shore. If we keep nodding to each other, then the adventurous, sedate and all those in between can be sure that our parade doesn’t have to end as long we refuse to be strangers. I wish Dudley could see the world as you do, John. I also loved the picture of Kathy and Cole. i read your post last year and as we rolled through the area I wondered if you were there. I looked. Wondering. I will ask you if next year you would like to experience the ride from a different persspective? You have a couple of options to choose from with us, the Tuttles, but I would ask you to consider being our guest and the story you would weave would surely go into the achieves of Erie’s history. Please consider the offer. What a brilliant and moving essay! I love the way you think. I love the way you write. hello John & thank you for your kind note. knowing you are there makes me happy. often than it comes, these days.